Should a Skyscraper's Spire Count Towards Its Total Height? It's a hotly contested issue amongst architects and designers. Does a building's height stop at the highest usable floor, or should the spire above it count, too? What's the difference between a spire and an antenna? Does it really matter? Well, it does to the developer of the 1,776-foot-tall Freedom Tower. Next month, the nonprofit Council on Tall Buildings and Urban Habitat will decide if the Freedom Tower's spiny spire will count towards its total height. Staffed by some of the world's preeminent architects and engineers, this council is "the accepted arbiter on matters of skyscraper height," according to The Wall Street Journal. And they're conflicted over the Freedom Tower, since the building's planned spire, which would've featured a white geometric shell, got downgraded to a metal, antenna-like spear. While architectural spires traditionally count towards total building height, antennae do not. But should spires count at all? Isn't it a little lame that highest usable floor of the Sears Tower stands 83 feet taller than the Freedom Tower's highest floor, yet the Freedom Tower will likely be named the country's tallest building? 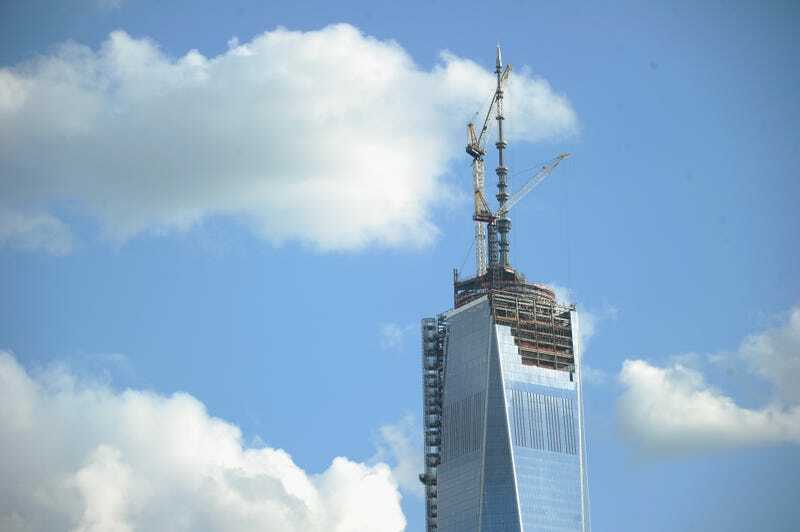 On the other hand, if the council decides to change its tune now, the Freedom Tower's very cheesy total height of 1,776 feet would drop to 1,383 feet, and that would piss off a lot of patriotic Americans. It would also bear serious implications around the world, where spires make up an average of 30 percent of the tallest skyscrapers' heights. So, what do you think? Should we keep counting spires towards total building height? Or should we save the superlatives for the buildings themselves, and put a stop to this trend of building skyscrapers that are almost more spire than building? Speak your mind in the comments.